Let the good times roll at Morton's The Steakhouse in New Orleans. Located just steps from the beloved French Quarter and the city's finest gaming and nightlife, the steakhouse holds as much character as the world-famous destination. 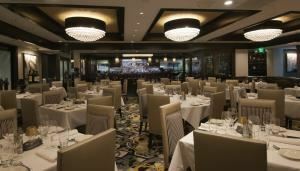 With its USDA prime-aged beef, succulent seafood and infinite wine selection, Morton's New Orleans is a favorite among locals, celebrities and professional athletes alike, and is the place to see and be seen. Every detail - from the rich mahogany wood, celebrity photo adorned walls and softly lit dining room - makes Morton's The Steakhouse in New Orleans a prime location to drink and dine before the big game, after a show or following a parade during Mardi Gras season. And as lagniappe, Morton's New Orleans can make any meal an exceptional experience with three Private Dining Rooms and state-of the art audio visual equipment. Not redeemable on existing contracted events and not valid with any other offer. Landry's Select Club points cannot be earned in conjunction with discounted or promotional group menus, with any other special group offer, employee discount or any other designated offer, discount, incentive promotion or dollar-off, limited-time promotion. Contact us for more details, terms and conditions. *Offer not valid with any other discounts. Management reserves all rights. Group contract terms and conditions will apply. Discount applies only to food - no alcohol. LSC points cannot be earned with this promotion or any other discount offer. Any event booked prior to July 1, 2014 is not eligible.